We are utilizing the email feature of Google Groups to do our emailings. Those messages are archived on Google, but you need a Google ID in order to view them. If you don't wish to get one, no problem. We are archiving all the emails right here. Here are the messages we've sent in descending date sequence. Everyone who has given us an email is automatically added to this list. So if you haven't, please send us your email. If you're familiar with Google Groups, it's generally used as a forum for participants to email postings that are then seen by the entire group. However, we are simply using it for one-way messaging, mostly for important messages of interest to our class including future reunions and obituaries. Using Google Groups as an email server gives us the following: 1) It's free, 2) It hides the emails of the group, and 3) Allows for easy administration of the emails in a secure environment, and not on this website. Happy Birthday, Class of '76! Whether we like it or not, our classmates will soon or have already celebrated their 60th birthdays. I've been using this image (both on the website and on our Facebook page) as a reminder to everyone that age is just a state of mind. Jean Kobin (Crabtree) is hosting a girls night out at her home in Cedarburg on Thursday, June 28th. The picture above is from the Spring 1976 Talent Show. This was part of a skit put on by members of Red Arrow. This will be outdoors, weather permitting. Bring a drink or appetizer. RSVP to Jean Crabtree (Kobin) or Debbie Hetzel (Hanson) for additional details. Summerfest starts in less than 2 weeks! It has been a tradition over the last several years that we have an "unofficial" reunion sometime during the festival. We will having one on Friday, June 29th hosted by me and Debbie. We plan on being there fairly late so if you're working that day, stop out later! You do not have to RSVP. This event is set and you can decide at the last moment. If you do come you probably should print out the map of the Summerfest grounds (if you're not familiar) as it shows the 3 meeting locations during the day. But more important is to have me or Debbie's cell phone. You can call or text us if you have difficulty finding us. But we realize not everyone can make that date. There is no reason why we can't do more than one day if there's enough interest. Summerfest goes on for 10 days, but the two weekends are probably preferable. Simply send me an email at genohanson@aol.com if have a preference or a date you already know when you'd be there. The very sad aspect of keeping you all informed is that from time to time I send out obituaries. I hope everyone has noticed that you haven't heard from me in a while so from that aspect that makes me happy. But I need to point out that I don't spend time pouring over recent obituaries. When I do report a death it's almost always because fellow classmates have given me the heads up. So if you have any word that one of our classmates or faculty have passed away, please send me an email so I can then inform the entire class. Debbie and I hope everyone had a Merry Christmas and we now wish to extend to our entire class a very Happy New Year! You haven’t heard from me in a while and that’s mostly a good thing because one of the saddest things I do is inform the class when I get news that a classmate or one of our faculty have passed away. The only report I received during all of 2018 was about Gloria Garcia who passed away one year ago today (Dec. 31, 2017) which I did not forward here because I did not find out until a month after her funeral. Here are some of the year’s highlights, almost all of this was posted on our class Facebook page. I thought I’d share some of the postings as not all of our class have Facebook accounts or are active on that site. By the end of this 2018, most of our class turned 60. We sure hope for everyone it doesn't feel like we're that old! January 17 - Miss Bertorello! 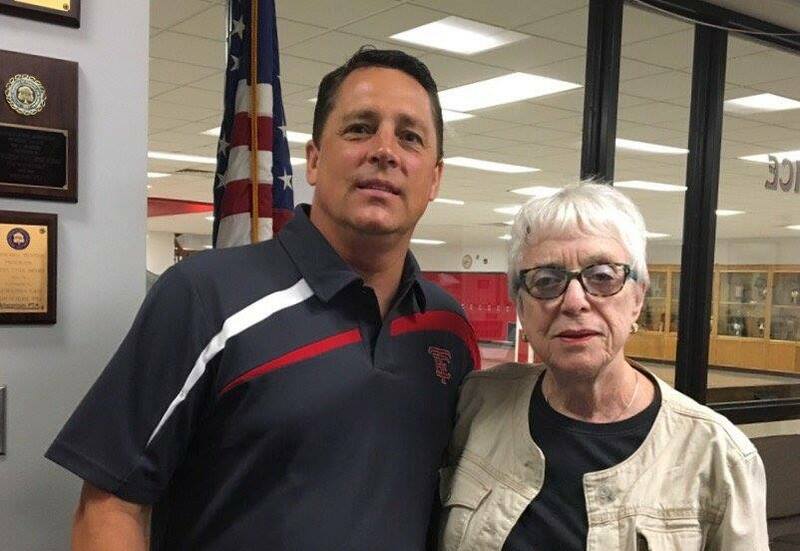 She’s still with us and I picked up this picture of her and current Principal Nick Hughes from the Tosa East website when she visited the school. She retired from East after the 97-98 school year. The posting generated a lot of discussion as she had a big influence on many of our classmates. 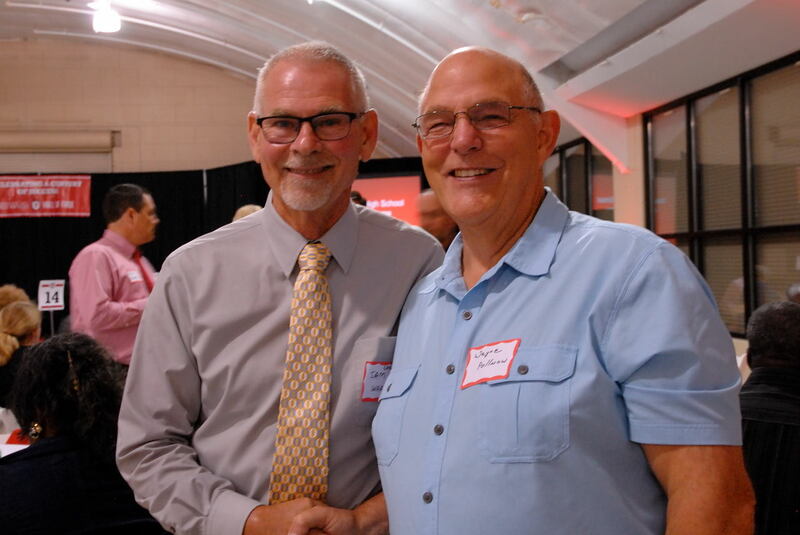 March 10 - Our classmate Bob Rech was interviewed for the PBS program Around the Corner with John McGivern for his episode on Brookfield & Elm Grove. If you don't want to watch the entire video (the link is below), go to 13:45 when his interview begins. June 28 - Girl’s Night Out. 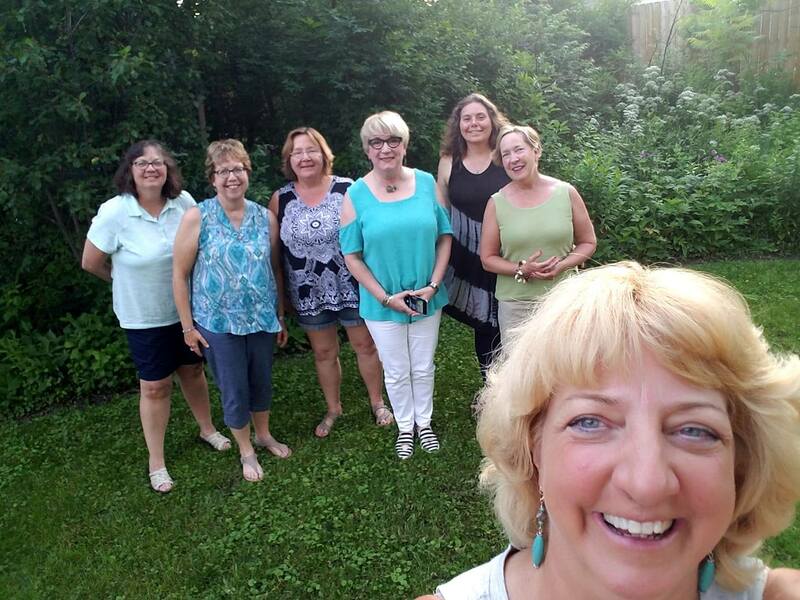 Jean Kobin (Crabtree) hosted a girls night out at her home in Cedarburg in June and Debbie Hanson (Hetzel) took this photo of the attendees. From left: Cindy Wagner, Tracey Schutz (Flemming), Heidi Guell (Fenzel), Carla Durand, Kim Sudar (Peterson), Jean Kobin (Crabtree), Debbie Hanson (Hetzel). July - The unofficial reunion at Summerfest was almost a complete bust and probably because of the outrageously hot weather - about 95 degrees. I thought we always headed to the lakefront to cool off? No such luck. We came back the following Sunday where it rained! In the pictures above: Left - Mary Fox and Debbie Hetzel. Right - Debbie Hetzel, John Lichty, and Gene Hanson. Again, everyone have a very Happy New Year!